With just a week to go until Coco’s due date is here, I thought I’d post some pictures of Coco’s nursery right now. I’m so happy with how it has turned out; it’s neutral but colourful, and I cannot wait until Coco is here so we can add some prints and personality to his or her room. This is our nursing corner. 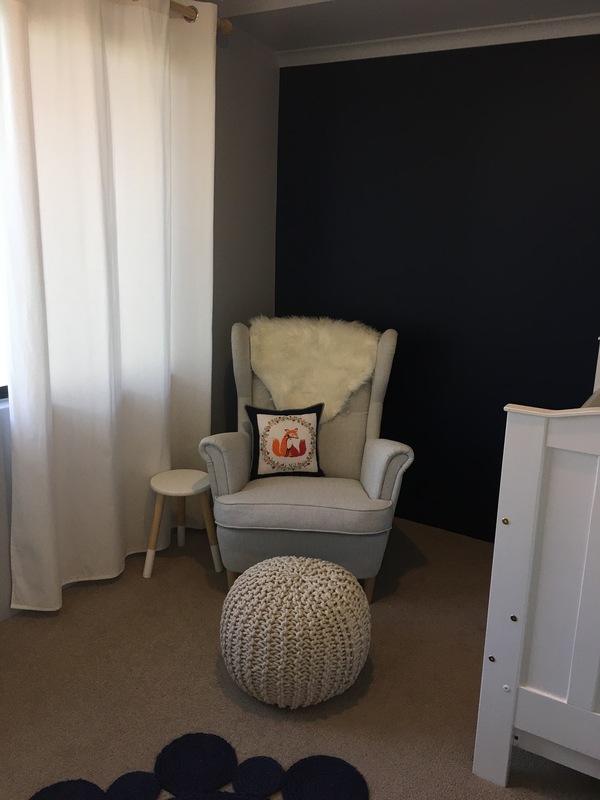 The wingback chair is courtesy of IKEA and Mr A has very kindly offered to turn it into a rocking chair (if I so desire – I’m not sure yet!). 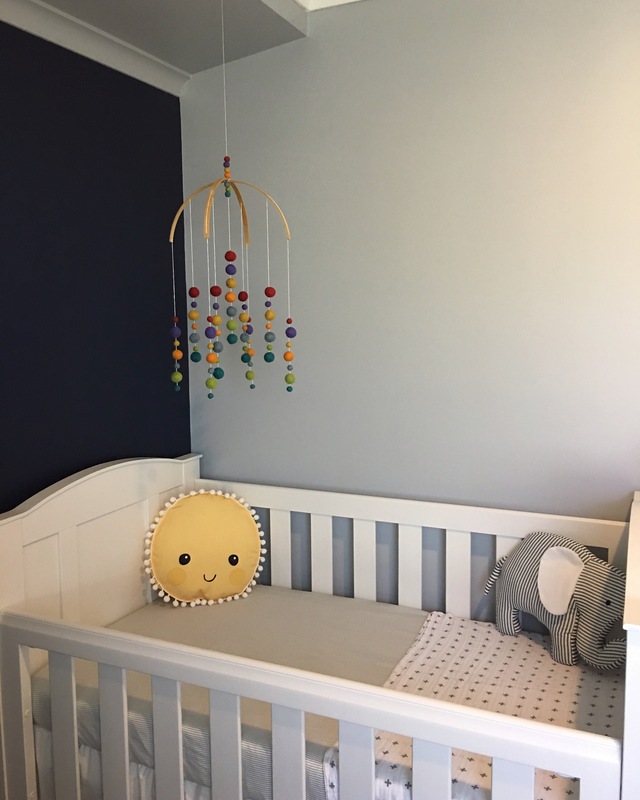 This is Coco’s crib featuring our gender neutral rainbow felt ball mobile! I absolutely LOVE it! It pops and spins in the wind when the window is open, and the colours pop against our navy feature wall. Coco likely won’t be in the crib for a little while, as he or she will be in a bassinet in our bedroom to begin with. This is our change station, which is actually in a walk in wardrobe. It features our DIY sewn cloth wipes, and minky / PUL changemat cover. In the drawers are our various cloth nappies that we’re using for Coco. It’s the cosiest space, and all we need is a new light for the room, plus a throw for the nursing chair in case we get cold. I finished Coco’s cross stitch over the weekend and will stitch this into a cushion for the nursery. 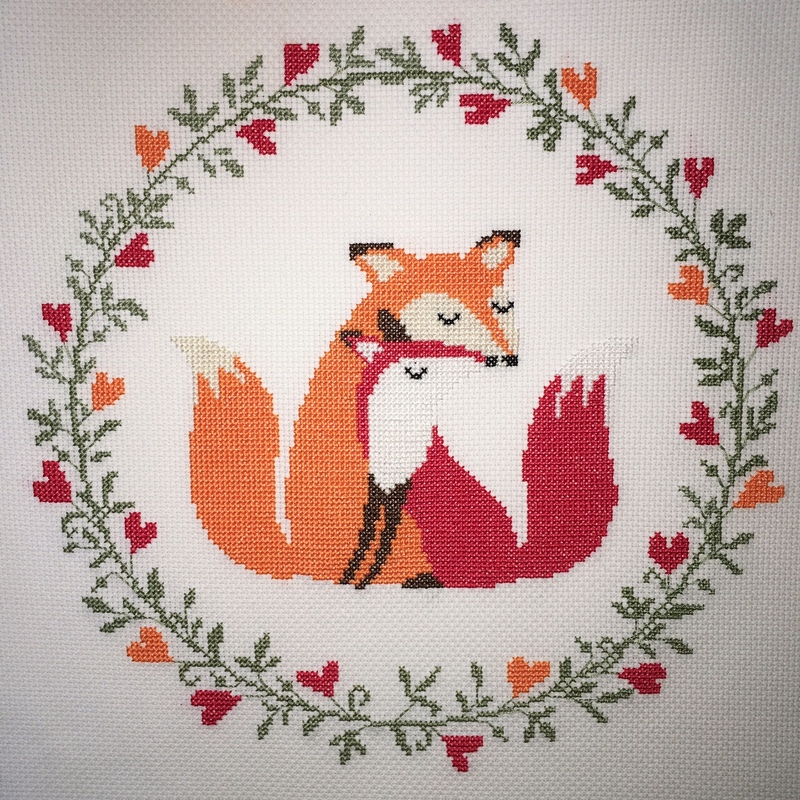 Somehow foxes have been a recurring theme in what we’ve chosen for the nursery, and I found this pattern so sweet I couldn’t pass it up. If you’re interested in the pattern, you can find it here. I’ve been stitching it on and off over the last 4 weeks and love how it has turned out. I’m planning on bordering it in navy fabric to suit the navy feature wall, and found some lovely grey metallic chevron fabric to back it with. Looking forward to showing you the finished result. Did you know that there isn’t a standard bassinet size in Australia? I sure didn’t! We purchased a secondhand bassinet as I couldn’t justify spending over $100 on an item that might only be used for a few months. We picked up a bargain, and were able to buy a great quality bassinet for $20. The only issue was the mattress including (from the original supplier) was so thin, and covered in a PVC material that it would rustle every time we touched it – not ideal when trying to put a newborn to sleep! I searched online for a new mattress which is when I realised there is no standard size. 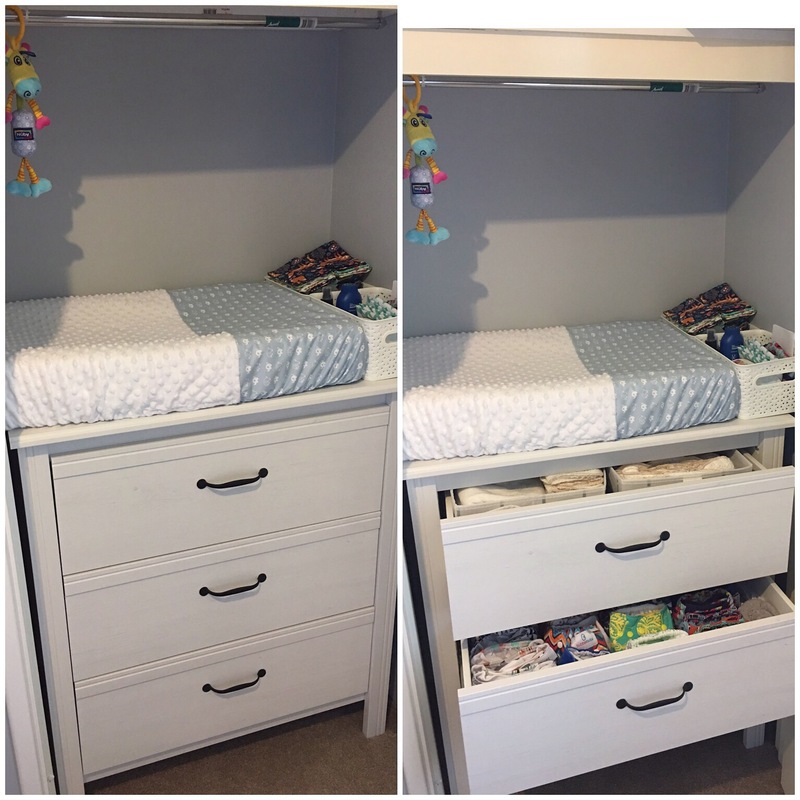 Our bassinet is 800mm x 400mm with rounded corners, and the cheapest I could find was over $60, as it would need to be posted – kind of defeating the purpose of purchasing second hand! I ended up getting foam which is 50mm thick, cut to the exact size required for half that cost thankfully. Whilst I was searching online, I also realised that bassinet sheets would be hard to come by, and the few sheets that I did find were quite plain and simple. I decided to make our own following similar instructions to those that I used for our DIY changing mat cover. They were really easy to make, and only took me an hour or so to sew up and to add the elastic in them. Check out my previous post and the link to instructions if you’d like to try your own. The best thing is there were great value ($18 for 4 bassinet covers, versus over $20 for 1 in the shops) AND I got to pick awesome fabric! I gave the fabric a wash and dry before I stitched it up of course, mainly to get rid of any chemicals that might be residing on it, but also to prevent shrinkage after their first wash. 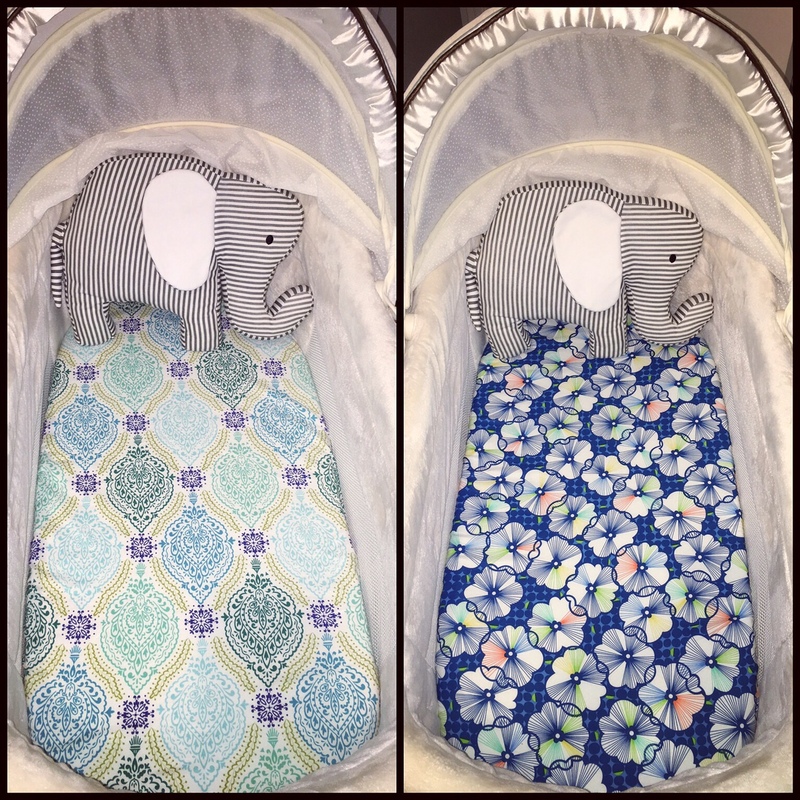 I used cotton for the sheets, and also stitched up a custom waterproof cover for the bassinet mattress (which I won’t show you, because let’s be honest, it’s not nearly as exciting as the sheets!). It’s a measly 7 weeks until we reach our due date, and Coco is baking away happily right now! There are lots of bumps and stretches which I love feeling, and we cannot wait to meet our new addition.